If you’re interested in purchasing used commercial vessels for sale, you might be wondering if you should go through a brokerage service. Boat or shipbrokers are a highly valued commodity in the used vessel market. Thanks to the interconnectivity of the modern world, boat brokers can scour hundreds of listings to find the best commercial vessels for sale that match your specifications. This is an especially significant advantage since, unlike a personal boat, commercial vessels are generally a necessary investment that requires few, if any, compromises. But aside from boat brokers being able to do what most people simply don’t have the time to, what other advantages are there for using a vessel brokerage service? Let’s explore some of the highlights below for buying commercial vessels for sale from international ship brokers like Ocean Marine Brokerage Services. As previously stated, the first and most obvious benefit to buying commercial vessels for sale from shipbrokers is the number of selections you have to choose from. Since international brokerage services have agents or representatives in most regions in the world, the chances for finding a ship that meets your specifications is greatly improved. This not only means being able to get exactly what you are looking for but also compare prices so that you get the most value from your purchase. Additionally, shipbrokers can help to verify the information beforehand and save you the headache of traveling long distances only to wind up disappointed by a dishonest listing. A common misconception about ship brokers is that they are only there to help sellers and are not interested in buyers. This simply isn’t true! Shipbrokers are intent on matching interested buyers with sellers in order to reach a mutually beneficial deal. This usually amounts to a successful venture from both sides because a boat broker doesn’t want to waste either party’s time. In fact, many ship brokers have a great relationship with sellers and can help to lower the listed price if they believe them to be a good match. 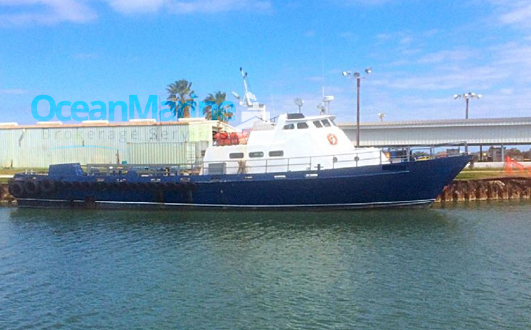 Consider looking at commercial vessels for sale sort of like looking at homes. Would you want to go around without the help of a real estate agent giving you inside knowledge and experience? This added experience in negotiating price, terms, and conditions is a worthwhile advantage that could wind up saving you thousands of dollars in the end. To look at commercial vessels for sale online, check out the listings at Ocean Marine Brokerage Services. If you have any questions regarding a listing or wish to speak to a broker directly, contact our staff or call 985-448-0409.